This woman was a rich young Christian who was martyred in the latter part of the third century. Lucy's mother arranged a marriage for her to a pagan man. Lucy, however had vowed to give her life to Christ. She knew her mother would not be convinced of her vows. Lucy prayed for a cure to her mother's long hemorrhagic illness. her mother's illness was cured miraculously. As a result, her grateful mother allowed Lucy to devote her life to Christ. Lucy's rejected pagan bridegroom denounced Lucy as a Christian. The governor intended to force Lucy into prostitution. When the guards came for her they found her stiff and heavy. Even when a team of oxen was hitched to her, she could not be moved from the spot she stood. The governor ordered her killed instead. They tortured Lucy, including tearing out her eyes (which is why she is often depicted holding a dish with eyes in it). She was surrounded by bundles of wood which were set on fire...the fire went out...even though she had been covered with resin and oil. All else failing, the governor had Lucy stabbed in the heart. 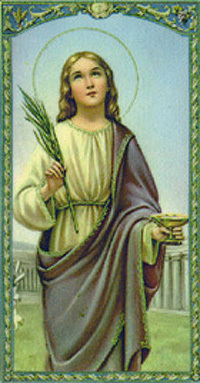 St. Lucy is the patron saint to cure hemorrhages, blind people, blindness (including Spiritual blindness), dysentery, eye diseases, eye problems, and throat infections. And the patron saint of authors, glaziers, laborers, martyrs, peasants, saddlers, salesmen, stained glass workers, writers and Perugia, Italy, and Syracuse, Sicily. Her feast day is extensively celebrated in the Nordic countries, especially Sweden. We ask that you please share any miracles or answers to prayers that St. Lucy has helped you with. Please email us your testimonies and we will be glad to share them (removing names if you wish). Thank you!